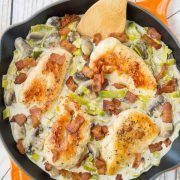 This White Wine Chicken with Mushrooms, Bacon and Leeks is creamy, rich and so easy to make! Perfect for entertaining or every day dining. I know I say, “Winner, winner, chicken dinner” fairly often. I can’t help myself, as much as I wish I could. But this one? WINNER, WINNER, CHICKEN DINNER. It’s SO good. 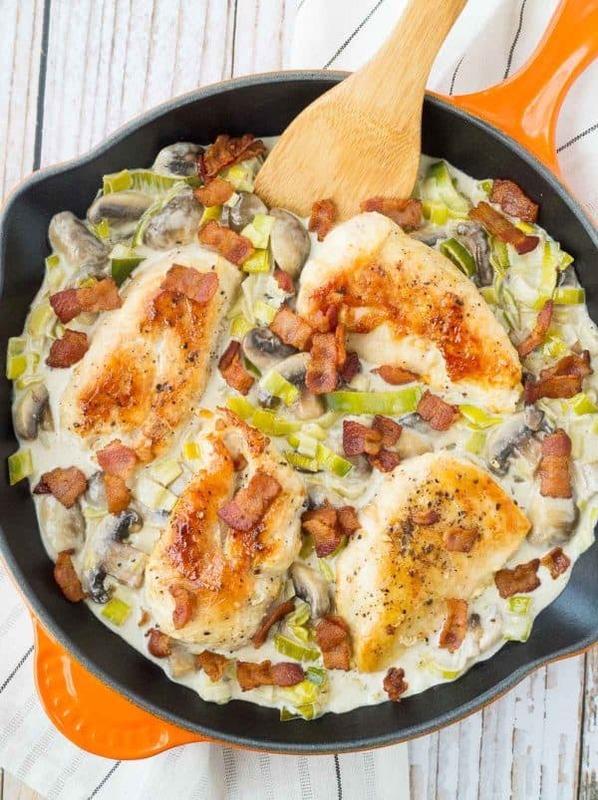 I mean, bacon, leeks, mushrooms, white cooking wine, cream…how do you go wrong? Ben loooooved this — seriously one of his favorites in awhile! It’s a classy dish without being snooty or hard to prepare. 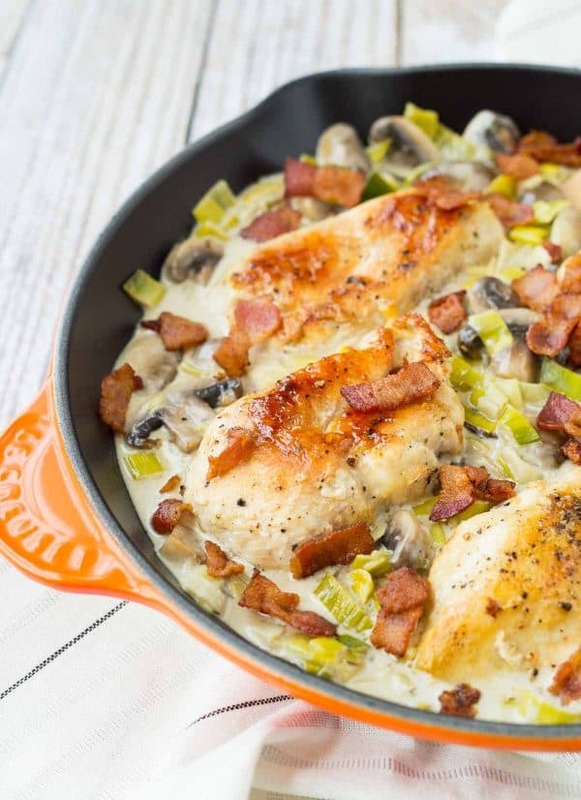 This white wine chicken is the kind of chicken recipe that will be a total crowd pleaser, unless you don’t like mushrooms. But if you don’t like mushrooms, I don’t want to associate with you. Just kidding, I love all of you, no matter your opinion on mushrooms. Best part is, it’s all made in one skillet. I told you I’d be coming strong with the one pan meals this month. Less dishes, more time to socialize with your guests. Or your family, because this meal transitions smoothly from entertaining to family dinners. I love using wine when I cook because it adds such a great intrigue and layer of flavor. It really kicks recipes up a notch and this recipe is no different. 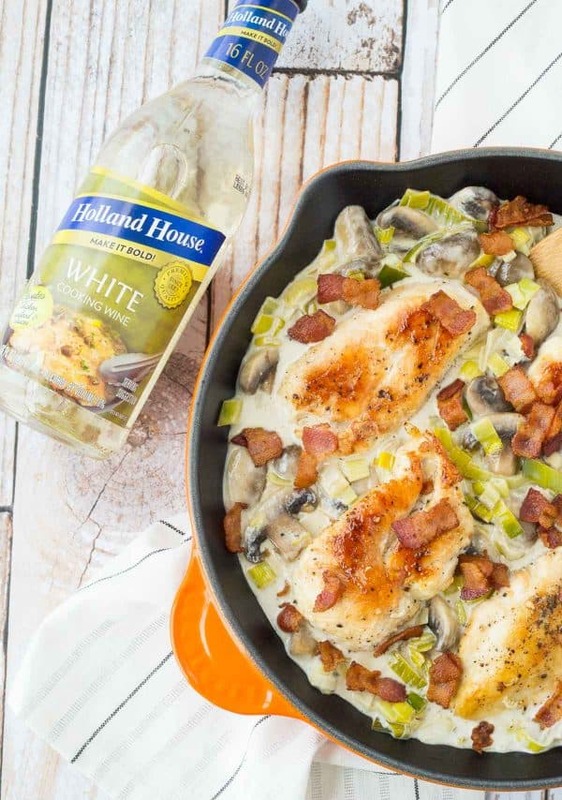 I used Holland House White Cooking Wine, which is the perfect addition to a cream sauce or to a chicken recipe. Or in this case, both! (Further proof, if you need it: This chicken and spinach pasta with lemon cream sauce.) 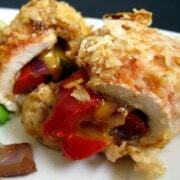 You can of course use any of your favorite dry white wines for this white wine chicken. I’d avoid any sweet wine in this recipe as it will alter the taste. This recipe is fantastic paired with a green salad or a side of simple pasta, or both. 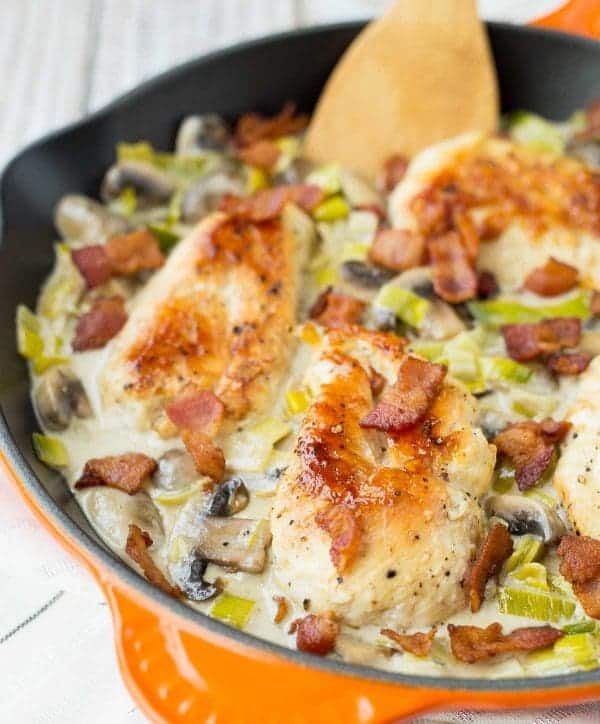 I think an angel hair pasta with some butter, olive oil, and a ton of fresh herbs would be great served with this skillet chicken with mushrooms and white wine. Keep it simple not only for your own sanity but also to really let this chicken shine, because it certainly does just that. PS: You cook the leeks in bacon grease. You’re welcome. In a large, deep skillet, heat olive oil over medium heat. Add chicken and cook for 8 minutes on one side before flipping and cooking for an additional 8 minutes or until cooked through (internal temperature of 165 degrees Fahrenheit). Remove to a plate. To the pan, add bacon and cook until crispy. Remove bacon to a paper towel lined plate, keeping grease in pan. Add leeks to bacon grease and cook until starting to soften. Add mushrooms and continue to stir and cook until mushrooms are browned and cooked. Add Holland House White Cooking Wine and increase heat to medium-high. Cook until liquid is reduced by about half. 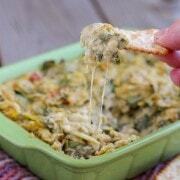 Reduce heat to medium and add cream and parmesan cheese. Simmer until thickened and add chicken and bacon back to the pan. Serve immediately. Note: Make sure to wash your leeks really well – they hide a lot of dirt! If you’re unfamiliar with how to do this, this is a really helpful video. I have my kids help — they love swishing around the leeks in the water. Note: If you need to reheat leftovers, the best method is to return to a skillet and heat, covered, on medium-low heat until heated through. The microwave is not this recipe’s friend. Verdict: I want to go swimming in the sauce. Husband’s take: He loved this. Loved, loved, loved it. Raved about it. Changes I would make: None! Please don’t! 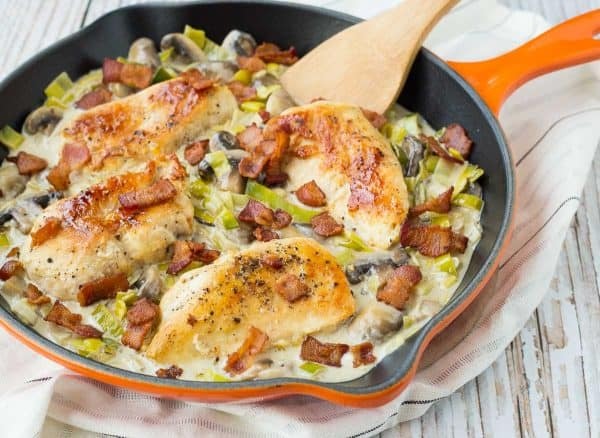 Disclaimer: This white wine chicken with mushrooms recipe was created in connection with my agreement as a partner with Holland House Cooking Wines. 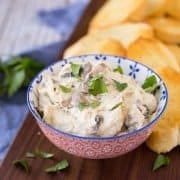 Holland House compensated me for the time required to create this recipe and share it with you. All opinions are always my own. Thank you for supporting my blog by reading about brands I use and love in my own home. Very Yum!! Everyone from toddler to grandparents thought it was great. So happy to hear that! Thanks for taking the time to come back and leave a comment, Tara! Wow, this looks incredible! I love that it is keto friendly and I can eat this!! Amazing ! Loved it. Served with homemade mashed potatoes. I’m so happy to hear that! I bet it was great with mashed potatoes. Thanks for taking the time to come back and leave a comment, it means so much to me! OMG what is not to love …. I give it top marks plus !!! Thank you, Denise! So glad you love this one!